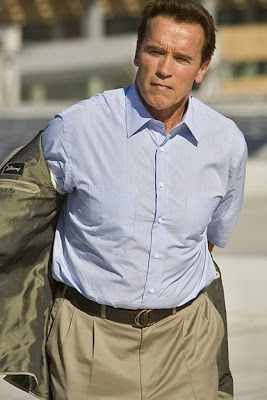 Governor Schwarzenegger was in Los Angeles yesterday to help launch the new solar panels atop the Staples Center. 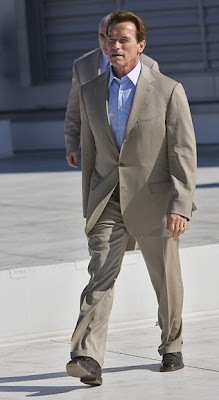 The Governor showed up wearing an amazing tieless Brioni suit. Brioni are among the world's most expensive suit makers. Each hand sewn made suit can take up to 18 hours to make and can cost up to 10 thousand US dollars each. Brioni also created the suits for the James Bond films 1995-2006. Brioni is based in Abruzzo, Italy. Other notable Brioni suit owners, Al Pacino, Robert Kennedy, John Wayne, Jim Belushi, George Bush, John Gotti, and Clark Gable.